Minimum wage policies are controversial in developed and emerging economies alike. This column focuses on China, where minimum wage changes have been particularly frequent and heterogeneous across counties. Results show that Chinese low-income households fully spend their incremental income, with no differences in consumption behaviour across more or less financially constrained households. Only households without a child generally consume a lower proportion of their additional income. In the first decade of the new century, China's President Hu Jintao pursued a “harmonious society” policy agenda promising more social justice and income equality. One way to decrease inequality is to promote active minimum wage policies in order to improve the welfare of poorer households (Autor et al. 2016, Lee 1999). In this column, we present new research on the impact of China’s minimum wage policy on consumption spending of Chinese households during the period 2002-2009 (Dautovic et al. 2017). Household consumption provides a particularly relevant metric of welfare because it is often better measured and less volatile than income (Deaton 1997, Deaton and Grosh 2000). In the literature on development economics, consumption is the standard measure to assess the relative poverty of households, and The World Bank relies on consumption measures to construct the international extreme poverty line (Ravallion et al. 2009). Minimum wage policies encounter opposition due to perceived unemployment risk, threats to industrial competitiveness, and employment substitution into the informal labour market (Rama 2001, Fang and Lin 2015). However, there are additional impediments to why higher minimum wages may fail to translate into higher levels of household consumption. First, higher minimum wages may simply substitute for other social transfers, which attenuates any effective income increase. Second, the disposable income effect of higher minimum wages may be perceived as transitory – particularly in emerging countries with higher price inflation – and induce household to save the wage increase which may then result only in modest consumption increase. Third, higher minimum wages may increase unemployment risk, spur precautionary saving and again attenuate the consumption effect. Against the background of these concerns, our study is the first to estimate the consumption and income response of Chinese households to the large cross-sectional and intertemporal variation of China's minimum wages. For the period 2002-2009, we identify more than 13,874 changes in the local minimum wage across China's 2,183 counties and 285 cities, and match them to the urban household survey (UHS) which covers 73,164 urban household-year observations. Figure 1 documents the minimum wage increases across Chinese counties and cities for the period 1996 to 2012. Particularly after 2004, many counties experienced substantial nominal increases in their minimum wage above 20% as illustrated by the green component of the bar plot. No other labour market in the world can rival China in the frequency, heterogeneity, and magnitude of local minimum wage changes, and hence it presents an ideal territory for research. Note: We plot by year the percentage of China’s 2,183 counties and 285 cities in our sample with a strictly positive nominal minimum wage change between 0 and 10%, between 10% and 20%, and above 20%, respectively. The column height represents the combined share of counties experiencing an increase of their nominal minimum wage in a given year. Do relative minimum wage shocks increase household consumption? A first look at the data helps to explain our main results. We identify yearly minimum wage increases at the county level relative to the province level, and sort all household observations into 40 (equally large) bins based on the relative local minimum wage increase. Figure 2 plots the real consumption increase in each of the 40 household bins (y-axis) against the average relative real minimum wage increase (x-axis) separately for two types of households in each bin. Blue dots represent the average consumption increase for households with a zero share (S=0) of minimum wage income, whereas red dots correspond to the low-income households for which the minimum wage represents at least 50% of the household income share (S>0.5). 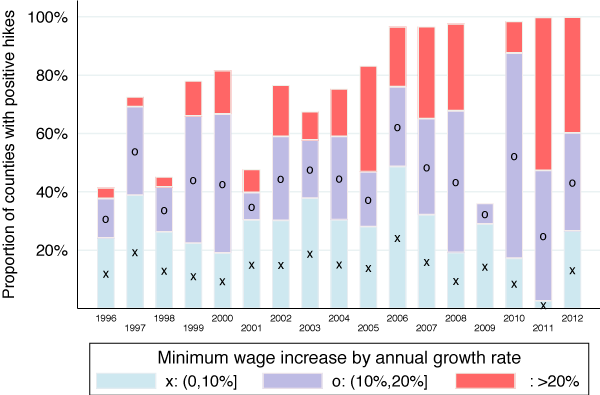 The dashed red regression line shows a positive correlation between consumption changes and minimum wage changes for households for which minimum wages matter, and the blue solid line shows the absence of such a correlation for households with wages of all members above the minimum wage level. Note: Average real consumption changes are plotted for minimum wage dependent households (S>0.5, red crosses) and those without minimum wage income (S=0, blue dots), where we sort all households into 40 bins according to the magnitude of the local real minimum wage increase relative to province level average minimum wage change. The dashed line represents the fitted linear relationship for minimum wage dependent households and the solid line for households without minimum wage income. Figure 2 provides descriptive evidence on the relationship between minimum wage changes and consumption changes. An economic analysis at the household level allows for a much sharper inference on the consumption response of Chinse households. After taking into account household characteristics and macroeconomic variation at the province level, we show that low-income households spend their entire additional income from a higher minimum wage. A minimum wage increase by 100 RMB raise consumption by 100-130 RMB depending on the model specification. We also find that, for poorer households, 40% of the additional minimum wage income is spend on health care and educational expenditure with potential long-term benefits for household income and welfare. Do household liquidity constraints matter? This high propensity to consume the incremental disposable income could be the result of borrowing constraints faced by China’s low-income households (Zeldes 1989). Given China’s high rate of income growth, households may expect a lifetime income justifying a consumption level above the current disposable income. However, the minimum wage elasticity of consumption to (persistent) shocks does not differ significantly when we consider more or less liquidity-constrained households. Only households without a child feature a significantly lower consumption elasticity. Evidence from the US suggests that local minimum wage increases often crowed out other social transfers because of eligibility thresholds (Neumark and Wascher 2011). The opposite effect is observed for China, where local minimum wage increases often coincide with increased (rather the decreased) social transfers. Social transfers therefore magnify the income effect of minimum wage hikes on consumption. This suggests that local minimum wage increases in China are often part of a more comprehensive social policy towards low-income households. At the same time, high-income households do not experience commensurate increases in their transfer income whenever minimum wages increase. New research shows that minimum wage policy and complementary social transfers had a positive impact on the consumption level of China’s low-income urban households. 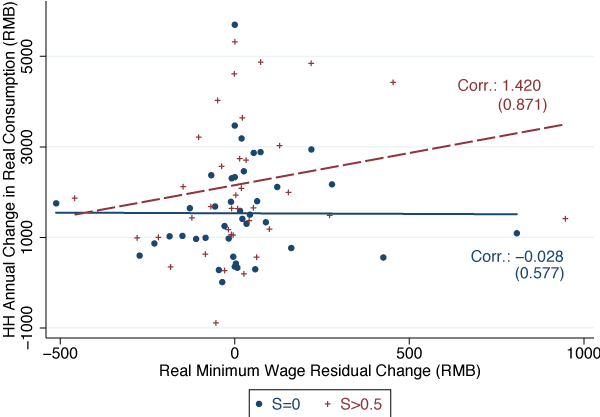 In China, local minimum wage increases often coincide with additional increases in social transfers so that the nominal minimum wage hike underestimates the full income effect for low-income households. Chinese low-income households fully spend their incremental income and we find no differences in household consumption behaviour across more or less financially constrained households. Only households without a child generally consume a lower proportion of their additional income. A surprisingly large share of the incremental income is spent on healthcare and education with (presumably) additional long-run benefits for household welfare. Autor D H, A Manning and C L Smith (2016), “The contribution of the minimum wage to US wage inequality over three decades: a reassessment”, American Economic Journal: Applied Economics 8(1): 58-99. Dautovic, E, H Hau and Y Huang (2017), “The consumption response to minimum wages: Evidence from Chinese households”, CEPR, Discussion Paper no 12057. Deaton, A (1997), “The analysis of household surveys: A microeconometric approach to development policy”, World Bank, Washington, DC. Deaton, A and M Grosh (2000), “Consumption: Designing household survey questionnaires for developing countries: Lessons from ten years of LSMS experience”, World Bank, Washington, DC. Fang, T and C Lin (2015), “Minimum wages and employment in China”, IZA Journal of Labor Policy 4(1): 1-30. Jappelli, T and L Pistaferri (2010), “The consumption response to income changes”, Annual Review of Economics 2(1): 479-506. Lee, D S (1999), “Wage inequality in the United States during the 1980s: Rising dispersion or falling minimum wage?” The Quarterly Journal of Economics 114(3): 977-1023. Neumark, D and W Wascher (2011), “Does a higher minimum wage enhance the effectiveness of the earned income tax credit?” Industrial & Labor Relations Review 64(4): 712-746. Rama, M (2001), “The consequences of doubling the minimum wage: The case of Indonesia”, Industrial & Labor Relations Review 54(4): 864-881. Ravallion, M, S Chen and P Sangraula (2009), “Dollar a day revisited”, The World Bank Economic Review 23(2): 163-184. Zeldes, S P (1989), “Consumption and liquidity constraints: An empirical investigation”, The Journal of Political Economy 97(2): 305-346.